There are many things to consider when hiring an artist to paint your vision, but first and foremost, choose an artist because you like the way they paint. It’s probably not the best idea to hire an artist who paints classical portraits for an impressionistic landscape. Some artists can paint in many different styles, but as a general rule, I would advise working with an artist where you can see strong examples of their work and hire them for that. To protect both the artist and the client, there needs to be a clear contract outlining the expectations on both sides regarding size, medium, substrate, subject matter, colors, and style along with price, date of completion, and who is responsible to frame, transport, and install the art. I always ask for half up front and half upon completion. Now you can get to the fun part of creating! Know your own desires. Artists are perceptive but not mind readers. 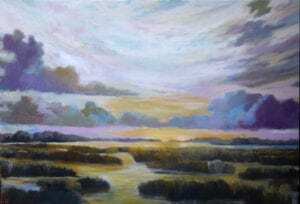 Offer samples of artwork that you like and elements of paintings that interest you. 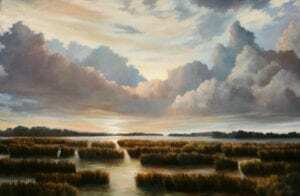 For example, I recently painted a 5’ x 7’ canvas of a marsh scene for a client in South Carolina. I asked them many questions; for instance, what is their favorite season and time of day? Do they like misty, monochromatic landscapes or bright sunsets? What is their color scheme? What room will the art hang in and how will it be lit? And most important, what sort of mood or feeling do they want to evoke? 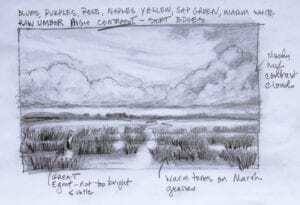 My clients understood how important it is for an artist to study their subject matter and flew me to Palmetto Bluff, South Carolina, to photograph the marshes at different times of day and to experience their environment. We talked a great deal about what they envisioned, and I showed them examples of my work and photographs to discuss what elements they liked. That trip helped me immensely to see and understand my clients’ world, their home where the art will be hung, and their vision. Since I’m a process-oriented painter (meaning I make decisions as I go as opposed to planning the whole painting in advance), I gave them a rough idea of the layout and emailed them pictures of my progress at different points of completion. They responded that they liked where it was going. There needs to be a foundation of trust with art commissions. Since I couldn’t show them a final rendering, they had to have faith in me—that I would create a painting they would love. 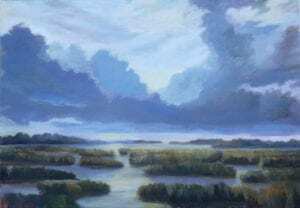 At this point, I’m trying to figure out what sort of clouds will look best with the marshes. I painted the base of the painting in acrylics (to work out all the compositional issues and color palette) then moved on to finesse it with oil paints. After a few months, I was ready for a client visit. As an artist, all you can do is pray that your clients will approve what you’ve done, because to reverse all the hours you have put into the painting would be disheartening to say the least. I lit the painting, asked them to stand far enough away to see it properly, and waited. They immediately proclaimed, “We love it!” Whew . . . a sigh of relief. Painting a commissioned piece can be stressful or delightful. 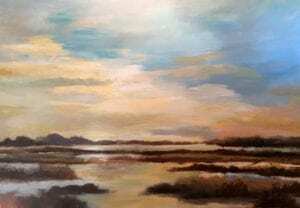 In this case it was a joy to paint something I loved and for clients who became friends and who were appreciative and understood the artistic process. I cannot wait to visit them and see our mutual creation in their gorgeous new home by the water, where I hope my art will be enjoyed for many years to come.